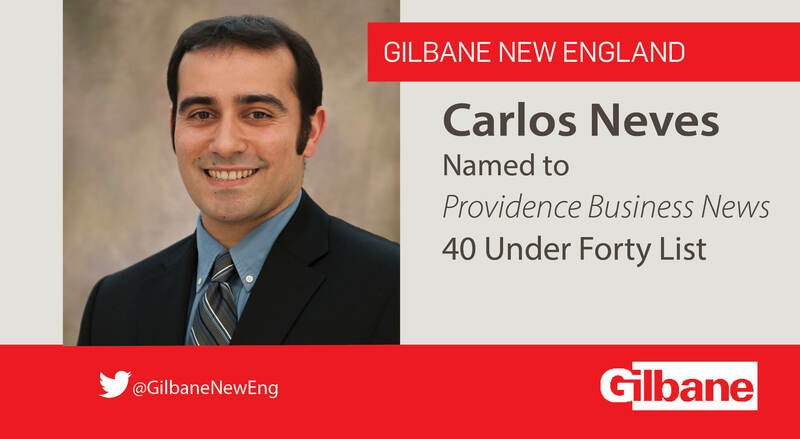 Carlos Neves, Project Manager for Gilbane Building Company, has been named to Providence Business News 40 Under Forty List. Carlos Neves, Project Manager for Gilbane Building Company, has been named to Providence Business News 40 Under Forty List. Providence Business News 40 Under Forty winners were selected based on career success and community involvement. The women and men recognized in the 2017 edition of the competition were chosen from nearly 200 applicants, the most submissions Providence Business News has ever received. From the onset of his career with Gilbane more than a decade ago, Carlos has excelled in every capacity. He is an alumnus of Gilbane’s Management Candidates Acceleration Program (MCAP), an intensive two-year program that provides hands-on experiences in a variety of roles and functional areas of construction management within Gilbane. Carlos is also a recent graduate of the prestigious Leadership Rhode Island program which recognizes emerging leaders and works to assist with their personal growth and professional development enabling graduates to positively impact their communities. His altruistic nature is demonstrated through his involvement with various local charitable and non-profit organizations including the ACE Mentor Program, Ronald McDonald House of Providence, and Rebuild Together.